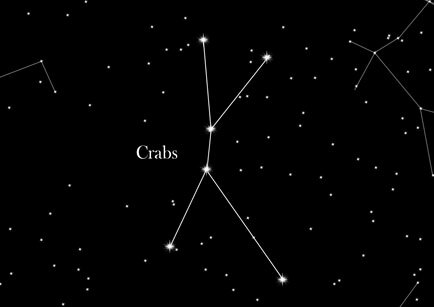 The Crab, also known under its Latin name “Cancer”, is a constellation found on the ecliptic plane. As of 2002, the Sun is in the constellation from 21st July to 10th August each year. As a zodiac sign, the Crab has special astrological significance and influences people's fate. The Crab takes a shape of two successive Ys connected at their bases. It is difficult to see with the naked eye, as it consists primarily of relatively faint stars. The easiest way to find it is to draw an imaginary line between the clearly visible Twins (Gemini – to the right of the Crab) and the Lion (Leo, to its left). An interesting legend is attached to the astrological sign of Cancer. It is said that Heracles, an illegitimate son of Zeus, had to fight a water snake. During the battle, Hera, the mother of gods, who despised Heracles, sent a wicked crab to kill him. The animal bit Heracles on his heel so hard that he became furious. He grabbed the crab and tossed it up so powerfully, that it flew up into the sky where it can still be seen today as the constellation the Crab. Astrological significance: People born under this sign are very sensitive and emotional. They are considered rather introvert and shy, but at the same time they are capable of being very sociable and empathic. They are cautious when it comes to financial matters. Their element is water.